Today was quite a day. I had two, sick, cranky boys to take care of and they were pretty big assholes. Is that okay to put out there?!?! No one will read this anyways right haha! Anyone that knows me knows how much I truly adore my sweet little boys. But…anyone that has a toddler knows what huge assholes they can be! Today was one of those days. They are great now…asleep in their beds ;). To the point…I actually have this AMAZING way of clearing out my youngest sons nose. This is not something I was aware of with my oldest son but I wish I would have known sooner. It truly is the best way to clear out your baby’s nose. It’s the same concept as the Netty pot for adults. Below is the video on what I do. It’s too much to explain so I figured I would post a video of how to do it. It’s an older video of my son from like 2 months back but it doesn’t really matter. I did the same thing today, just dealt with a little more hand swatting. I recommend doing this before naps or bedtime to help keep your infant/toddler clear and breathing easily. Instructions for the saline mixture: I mixed 1cup of lukewarm water, 2-3tsp of sea salt and 1tsp of baking soda. I filled the bulb with the saline mixture and proceeded to squirt it up his nose. As you can see from the video, it flushes all of the mucus out of the other nostril. 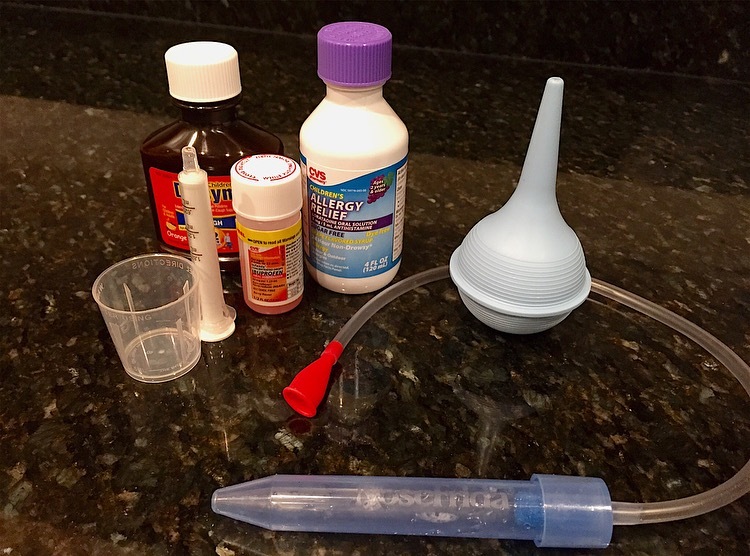 Repeat the rinse twice on each side and use a nasal aspirator, I use Nosefrida Baby Nasal Aspirator, to suction any remaining mucus out after the rinse process is over! Let me just quickly review the Nosefrida Baby Nasal Aspirator. Some people may think it’s strange because you have to suction it out “manually”. Let me tell you, it is so easy to do and the most effective way I have tried so far! You can see all of the mucus clearing out so you know you are getting it all out, then you just open it up and clean the aspirator. Nothing stays inside like using the bulb! It’s a definite must have with a congested little one! We stumbled over here from a different page and thought I should check things out.I like what I see so now i am following you. Look forward to looking into your web page repeatedly.